Saint Michael Antiochian Orthodox Church in Van Nuys began serving Orthodox Christians in the San Fernando Valley on January 12, 1969. As a community we are grateful for God’s guidance, and for the dedication, love, hard work, and generous spirit of those who served St. Michael Church, and thus made it possible for the parish to grow spiritually and to prosper. Beginning with the readings of the Epistle and Gospel lessons at the first half of the service, followed by a sermon, the liturgy progresses to the offering of the bread and wine for the consecration and descent of the Holy Spirit for the receiving the Body and Blood of Christ (Holy Communion) by the Orthodox faithful. The liturgy’s prayers, composed by St. John Chrysostom (4th c.), dates back to the 7th century. On the five Sunday’s of Great Lent and five other major Feasts, the Eucharistic liturgy includes the longer prayers of the offering composed by St. Basil the Great. A service with readings, hymns and evening prayers on the eve of a major Feast, especially when the Divine Liturgy is celebrated on the following day. It prepares one for the festal celebration with meditations upon the theme of a Feast, beginning with the “sunset Psalm” (103) and includes the singing of one of the oldest extant hymns of the church: “O Gladsome Light,” glorifying the coming of Christ, the Giver of Light. The word literally means early morning. It is the name of the service, which by some has been called Matins, and still by others, Lauds, though it does not correspond exactly to either of the Western Services. 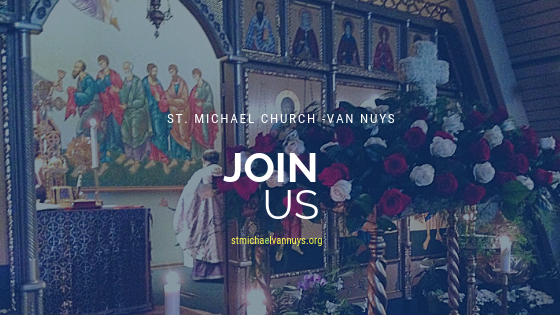 This service includes readings, hymns and morning prayers, done either in a shorter “daily” format, or on a day when followed by the Divine Liturgy, a longer “festal” format, concluding with hymns of praises and the glorification of the Christ, the Son of God the Father and the Holy Spirit. O Lord, I love the habitation of Thy house, and the place where Thy glory dwells. Our women’s group actively serves our parish and community. Join us! Teen SOYO is the youth group of our church. We would love for you to get involved.